Academy of Korean Studies- Korean studies and archives of ancient documents. AEAS Korean Genealogical Tables- Shows the geographic origin of Korean family names on a map of Korea. Capture2Text- Capture2Text Optical Character Recognition (OCR) and voice recognition. You put a box around HanJa or HanGul characters or words on the screen and Capture2Text will convert it to text! You can then paste the text into an online dictionary. Center for Korean Studies Materials- An excellent online collection of ancient Korean documents. Center for Korean Studies Materials - Ancient Genealogies- An excellent collection of Ancient Korean genealogical records. Chinese Tools- Chinese Tools can help you translate HanJa characters into English. Date Conversion for Solar to Korean Lunar Calendar- Korean Astronomy and Space Science Information (KASI) has an online Korean lunar/solar date converter. EveryCulture.com- An introduction to South Korea and its culture. Family Search - Korea Category- Korean genealogical records and information. Family Search Korean Collection- A free archive of images of Korean genealogical records, including family registries listed by family name. Family Search Korean Genealogy Wiki- Korean genealogical information including links, resources, maps, guides, and information. Genealogy Forum- A genealogy forum presented by genealogy.com. You can find forums that focus on specific family names, including Korean surnames. Google Search for Electronic JokBo (Family Register)- Find online family genealogies and histories. Google Translate - Korean- Translate Korean to English or English to Korean. The results are not always accurate, but it is easy to use. Handbook of Korean Vocabulary- This book organizes Korean vocabulary by common roots. This is the most effective way to learn HanJa and expand your Korean vocabulary. HanJa Book- This YouTube video introduces a great book on HanJa (Korean version of Chinese Characters) written by Bruce K. Grant. HanJa Dictionary- Korean Dictionary. You can draw HanJa (Korean "Chinese" Characters) with a mouse or type HanGul (Korean Alphabet) to search for HanJa characters, meanings, and common words containing a HanJa character. i2 OCR- Free online optical character recognition (OCR). It can recognize Korean or HanJa (in Chinese mode). Inje University Genealogy Library- Archive of Korean genealogy records. The browser plugin that reads the records requires a Korean version of windows to run properly. JokBo Library- Information about Korean family names, clans, and family records. KimHae Kim Clan JokBo Translation- Kimhae Kim JokBo including translations of the preface of the 1971 JokBo. Korea Genealogy Forum- A genealogy forum presented by genealogy.com that focuses on Korean genealogy. You can get help by posting questions here. Korean Ancestry Maps- Locations of Korean populations in the U.S.
Korean Family History- A great website by Professor Mark Peterson with English tutorials and information on Korean genealogy. Korean Genealogy- A community helping each other discover Korean genealogy. 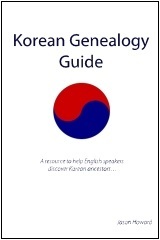 Korean Genealogy Guide- This book helps English speakers interpret Korean family registers (JokBo). It serves as both a reference and instruction guide on Korean writing (HanGul and HanJa), names, numbers, dates, history, genealogy vocabulary, and family registries (JokBo). Korean LDS Genealogy Society- Genealogy information from an unofficial LDS website in Korea. Korean Names- Find HanJa versions of HanGul Korean names. Korean-English-HanJa Dictionary- The best online Korean dictionary. Translates any direction between English, Korean HanGul, and HanJa. It can be used to show the meaning of Korean names. It also shows the HanJa options for HanGul syllables. LDS Korean Network- Resource for Korean Saints, including information to help with Korean genealogy research. Need to be a registered member to see content. Genealogy information is in the "계보사업" section. Learn Korean- Learn Korean language and culture. Name Dictionary- Korean website with information about names, types of family records, etc. Naver HanJa Name Dictionary- A dictionary of HanJa characters used in Korean names. The definitions are listed in Korean, but can be copied into a Korean-English dictionary to translate. There are also website translation options in Google Chrome. One Page Choson Calendar- One page Choson-China-Western Calendar created by Professor Oh Soo-chang at Seoul National University hosed on Harvard's website. Researching Korean Genealogy- Family Search forum on researching Korean genealogy. A great place to get help or learn about resources and approaches. South Korea GenWeb Project- Korean genealogy mailing lists, maps, and history. South Korean Family History and Genealogy- Information on Korean ancestors, family census registers, and links to genealogical libraries. Surname Info- Information about Korean family names, including lists of clans (GongPa) and HanJa characters used in the first names of each generation (HangRyeolPyo). UPenn Korean Resources- Online dictionaries, etc. Wictionary Korean Surnames- A list of Korean family names. Includes HanJa, HanGul, and popular variations of English spellings of Korean family names. Yes JokBo- JokBo site with information about JokBo records and some of the oldest JokBo records available online. HanJa Calligraphy Generator- Generate HanJa calligraphy in many styles. Best DNA Tests for Ancestry- Reviews of the best sites for determining ancestry thru DNA testing.